The year is 2020. The world hovers on the brink of annihilation. Preceded by a devastating orbital attack, a warlike alien race known as the Hydra has besieged the planet, their invasion force carried on enormous drop ships that dwarf city blocks and rain devastation from above. The Hydra's ultimate goal is to eradicate the last survivors of their ancient nemesis, the Ghin, an alien race that has taken refuge on Earth. Humanity is caught in the apocalyptic crossfire. As widespread panic grips the populace, governments topple, economies crumble, and order dissolves. In these desperate days, mankind's only hope lies with the Ghin and one of their most brilliant minds: Dr. Cronos, a being as guilty of atrocities against humanity as those who hunt him. 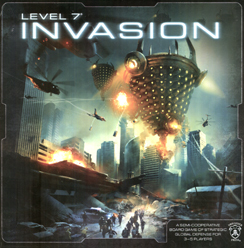 Level 7 [Invasion] is a semi-cooperative board game of strategic global defence for 3-5 players. As the planet is battered by the Hydra's relentless assault, you'll control Earth's desperation-forged coalitions in an effort to turn back the invasion. But soldiers aren't enough. You and your allies must manage your resources carefully to combat the threats of hysteria, famine, and population loss as well. Endure long enough and you might buy the time for Dr. Cronos to develop the advanced weaponry required to defeat the invading Hydra. The survival of the human race depends on your next move!